The most obvious way of getting around any Dutch city is by bike of course, but Rotterdam also offers many other forms of public transport, such as the bus, metro and even a water taxi. Here’s a guide on getting around Rotterdam. If you haven’t brought your own wheels, then there are several places where you can rent a bike in Rotterdam. Free bicycle parking facilities in the city centre, include: Rotterdam Centraal Station, Binnenrotte, Meent and Coolsingel and Central Station. You can also recharge your electrical bike here. For a small fee, there are also guarded bike racks at Centraal Station, where you can also recharge your electric bike if needs be. Who wouldn’t want to give the Water bus a try? This fast ferry service is just as much fun whether you are sightseeing in Rotterdam, or commuting between home and work. Use your public transport chip-card to pay (prices depend on the distance you travel) and bikes travel free, if there is enough space. Check the routes and timetables on the Water bus site (in Dutch). 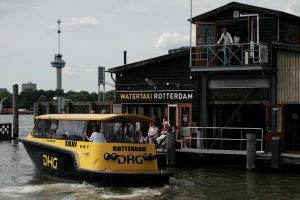 Just as cool as the water bus are Rotterdam’s water taxis – with about 50 landing stages in and around the city – and operating between Kinderdijk and Spijkenisse. Rotterdam’s water taxis can be ordered through www.watertaxirotterdam.nl. Ticket prices vary, depending on the number of people on board and the distance travelled. The classic HNY water taxi travels between Hotel New York and Veerhaven or Leuvehaven at least every 15 minutes (and sometimes even more frequently if it is busy). Water taxis can transport a maximum of 8 people and an adult’s ticket starts from € 2.90 (depending on whether you’re going to Leuvehaven or Veerhaven). Children’s tickets start from € 1.30. Rotterdam’s excellent public transport system includes busses, trams and metros, all run by the RET. To travel by public transport, you will need a valid public transport card, known as an ‘OV-chipkaart’. There are various types of cards available, and for up-to-date information, it’s best to see the RET website. EDITOR’S TIP! The Rotterdam Welcome Card makes travelling on public transport hassle-free. This chip-card provides one, two or three consecutive days of unlimited travel and is valid on all of Rotterdam’s RET bus, tram and metro-lines. Buy it here. There are five metro lines running through Rotterdam. Each of these routes is marked with their own letter (A-E), their own colour and with their final destination. If you get confused, it’s handy to remember that all the metro lines intersect at Beurs station, the biggest metro hub. Tram lines 8, 7, 21, 23, 21, 23, 24 and 25 all travel through the centre. All of the tram lines converge at Rotterdam Centraal Station, if you need to swap lines. Several bus routes run through Rotterdam’s centre, also connecting with other city neighbourhoods and the greater metropolitan area. Check the RET website for further information about routes and stops. Why not hire a car if you are planning on making day trips from Rotterdam to other Dutch cities? For instance, Haarlem, The Hague, Leiden and even Utrecht are all less than an hour away by car.